Bold, rational, and forward-looking, Turnaround offers vital lessons for developed and developing nations in search of stability and growth. Thirty years ago, China seemed hopelessly mired in poverty, Mexico triggered the Third World Debt Crisis, and Brazil suffered under hyperinflation. Since then, these and other developing countries have turned themselves around, while First World nations, battered by crises, depend more than ever on sustained growth in emerging markets. 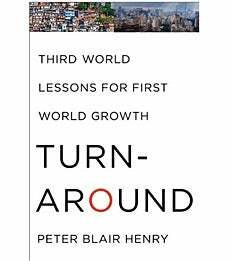 In Turnaround, economist Peter Blair Henry argues that the secret to emerging countries’ success (and ours) is discipline—sustained commitment to a pragmatic growth strategy. With the global economy teetering on the brink, the stakes are higher than ever. And because stakes are so high for all nations, we need less polarization and more focus on facts to answer the fundamental question: which policy reforms, implemented under what circumstances, actually increase economic efficiency? Pushing past the tired debates, Henry shows that the stock market’s forecasts of policy impact provide an important complement to traditional measures. Through examples ranging from the drastic income disparity between Barbados and his native Jamaica to the “catch up” economics of China and the taming of inflation in Latin America, Henry shows that in much of the emerging world the policy pendulum now swings toward prudence and self-control. With similar discipline and a dash of humility, he concludes, the First World may yet recover and create long-term prosperity for all its citizens. Peter Henry is Dean of Leonard N. Stern School of Business.